In general, Japanese people are so kind and always trying to help, however, be aware – many of them do not speak English so we found ourselves explaining things literally using our hands and feet. 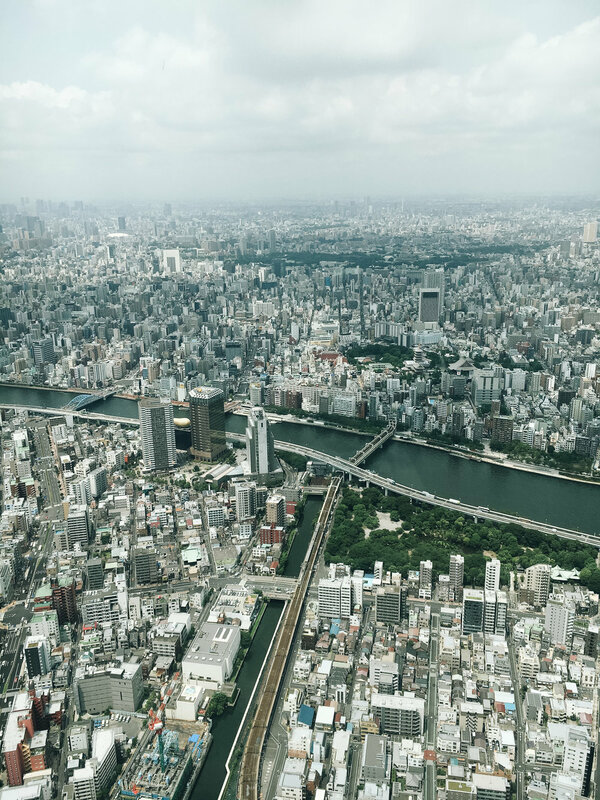 But let’s start with some basic facts about Japan you should know: Tokyo’s suburban area is the most populated in the world (38 million people) and it gets really hot during summer. In 2018 this got so bad that people even died because of the heat. When we went there, it had 35-40 degrees nearly every day. Additionally, it was a really humid heat, so it’s really important to drink enough water (that’s why occasionally you can spot a bottle of water in the pictures). Our hotel was located in Shinjuku, one of Tokyo’s prettiest areas. We immediately found ourselves in the middle of skyscrapers completely plastered with neon signs, numerous restaurants of every size and little hidden temples. Shinjuku is full of life, business and of course, tourists. Also, there’s a little area, called ‘Kabukicho’, filled with tiny restaurants – and if I say tiny, I really mean tiny. They mostly fit about 2-3 people inside, but they offer real authentic Japanese cuisine and the owners are extremely friendly. Of course, we also did karaoke once – it was a real experience. Japanese people love foreigners and so we were real stars in there! Tokyo has an excellent metro system which is easy to understand and brings you from one point to another quickly. Also, it’s the first city we visited where the system of “letting people exit the train before entering” really works. We then went to Shibuya, which is most famous for the ‘Shibuya crosswalk’ – the world’s busiest crosswalk. I’ve never seen anything like that before. And once again I have to add that despite the thousands of people, everything is calm and organized. Oh, and do you know the movie ‘Hachiko’? There’s even a statue dedicated to the loyal dog next to Shibuya station which is a famous tourist attraction. Like I have already mentioned, there are various temples and shrines spread over the city and one of the nicest was just 2 minutes from our hotel; especially since it seemed to be less known by tourists. We started our second day by going there and, in general, I have to say I love Japanese temples and shrines. During my stay, I visited an endless amount and my friend really got fed up at the end as sometimes it seems like they’re all the same, but every single one has somethings special. Also, I witnessed many locals coming there before or after work to think of their deceased relatives, which is a really kind gesture. 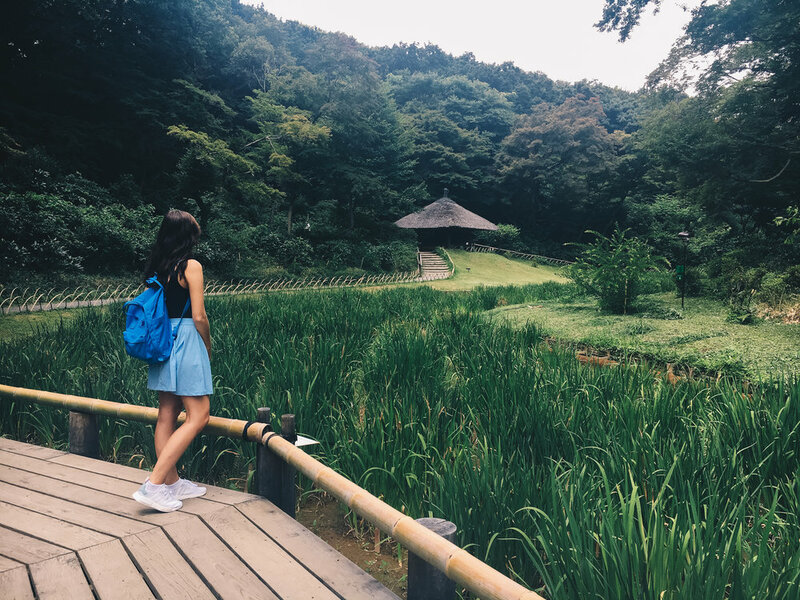 We then decided to walk to the Yoyogi Park, where the Meji-Shrine is located, but we’d recommend you taking the metro once again, as the heat was unbearable. The park was definitely the place that surprised me the most. Just to remind you, there are millions of people living in this city, but this park and the shrine felt like they were in another world. We both described it as ‘Bali-like’ even though we’ve never been there but it felt like the only thing missing there were people harvesting rice. The area around the shrine was filled with tourists, but somehow, it still felt really calm and quiet. We then went on to the Tokyo Tower but didn’t go up as we intended to do so the next day at the Skytree. Now to the Skytree. This is one of the highest towers worldwide and only when we were at the top did we realize how big Tokyo really is! It was so impressive not to be able to see the end of the city, no matter what direction we were looking in! Here, you realize what a metropole Tokyo really is and where these millions of people are living, despite of not feeling it down in the city buzz. This is definitely a must when visiting Japan’s capital. A ticket costs about 1,000- 2,000 Yen (that were between 7 and 14 € at the time, depending on which platform you want to visit) and it is surely worth the money, as it’s so astonishing. We then continued the day by visiting Asakusa. Asakusa is best known for its beautiful colourful temple. Like I already said I really love the bright reds. The area in front of the temple is filled with little stands where you can buy anything you can imagine – from food, to games, little presents and clothes. But it’s really hard to get a decent picture there without tons of people photobombing, since this place is always jam-packed with tourists. In the surroundings, you’ll find great little restaurants which offer you amazing sushi and other typical Japanese foods. I love when you can actually watch the cook prepare you meal! On our last day in Tokyo, we decided to take it slower, since we were planning to go out partying that night. We went to Hamarikyu Gardens, which is another big park in the city centre, located not too far from the imperial palace. It has a little lake and a very cute tea house in the middle and once again you feel like you’re in a remote area. From there we went to the famous Rainbow Bridge as it’s only a few minutes by foot to get there. You’ve definitely seen this one on pictures before and in reality it’s really impressive! Now to the fun part that day – later that night we went partying in Tokyo’s nightlife district: Roppongi. It was one of the craziest nights I have ever had. In Japan most of the clubs offer ladies free entry and also men only pay around 1000 Yen, so not even 10 Euros. The clubs are mostly located on the top floors of skyscrapers and Japanese people really know how to party. We even made friends with some very cute Japanese girls who keep telling us to come back! · Never ever take a subway that passes by Tokyo station or change trains there during rush hour – the Japanese might be organized and friendly, but the amount of people is just insane! · Oh, and in general, we were warned before going that Japan would be very expensive, but we can tell you from experience: it can be really affordable. Of course, it depends on where you go to eat, but with about 7€ you can get a more than decent meal. Japan might not be the cheapest place on earth, but we’ve been to countries far worse. · And even if taking the metro is super easy in Tokyo, I definitely recommend walking from time to time, as you’ll explore so many great little parts of the city you would’ve missed otherwise. · Something very fun you shouldn’t miss is MariCAR – yeah you guessed that right, it’s driving through Tokyo like in Mario Kart, together with your friends and in funny costumes. Sadly, we heard about that too late and as we didn’t have international driver‘s licenses, which are required, we weren’t able to try it. Everyone told us it’s amazing, so if you have the time, try it! You’ll find a link at the end of this blogpost.